WOW! HUGE PRICE REDUCTION. PRICED FOR A QUICK SALE. 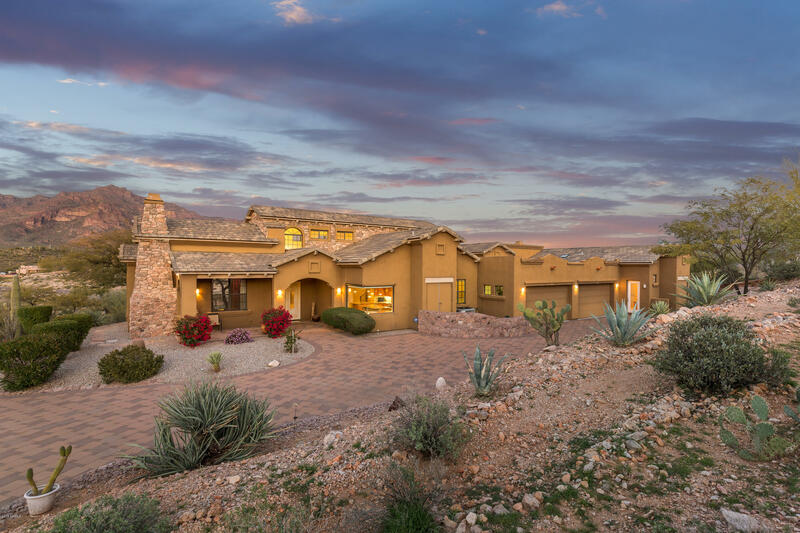 Wonderful custom home in desirable VISTA DEL CORAZON! Four bedroom, 3 1/2 baths with separate office that could be a 5th bedroom and a separate den. Elevated lot with magnificent VIEWS OF SUPERSTITION MOUNTAIN from all rooms on the back of the home. CITY LIGHT AND SUNSET VIEWS from kitchen and roof deck. Large gourmet kitchen with Viking appliances, seamless windows with great VIEWS. Large master suite with fireplace and walk-in closet. Loft is perfect for a MAN OR SHE CAVE, an extra den or a craft room. Roof deck is a great place to watch the MOUNTAIN TURN PINK! Lots of outdoor patio space to enjoy the views. Home is adjacent to hole #11 green of the Dinosaur Golf Course. Four car garage. A MUST SEE! All pertinent information, including square footage to be verified by the buyer.